Bernard Hill (born 17 December 1944) is an English film, stage and television actor. He is known for playing Yosser Hughes, the troubled 'hard man' whose life is falling apart in Alan Bleasdale's groundbreaking 1980s TV drama Boys from the Blackstuff and, more recently, as the Duke of Norfolk in the BBC adaption of Dame Hilary Mantel's Wolf Hall. He is also known for roles in blockbuster films, including Captain Edward Smith in Titanic, King Théoden in The Lord of the Rings film trilogy and Luther Plunkitt, the Warden of San Quentin Prison in the Clint Eastwood film True Crime. Hill was born in Blackley, Manchester. He was brought up in a Catholic family of miners. Hill attended Xaverian College, and then Manchester Polytechnic School of Drama at the same time as Richard Griffiths. He graduated with a diploma in theatre in 1970. Hill first came to prominence as Yosser Hughes, a Liverpool working class man ultimately driven to the edge by an uncaring system, in Alan Bleasdale's BBC Play for Today programme, The Black Stuff, and its more famous series sequel, Boys from the Blackstuff. His character's much-repeated phrase Gizza job ("Give us a job") became popular with protesters against Margaret Thatcher's government, because of the high unemployment of the time. With his bemused brood of kids never let out of his sight, Bernard Hill's powerful depiction of a man crumbling before the audience's eyes brought him numerous awards but, as he later revealed, almost "drove him to the edge of insanity". Hill then appeared as Sergeant Putnam in Gandhi (1982), directed by Richard Attenborough. Though Hill did not figure prominently in the cast, he benefited from being part of an Oscar-winning film. Next up for Hill was Roger Donaldson’s The Bounty (1984), a fourth dramatisation of the famed mutiny on HMS Bounty. He had previously taken smaller parts in a number of British television dramas, appearing in the acclaimed I, Claudius in 1976 as Gratus, the no-nonsense soldier of Caligula's bodyguard who drew Claudius from his hiding-place in the palace, and presented him as the proper heir to the empire, and also as Richard Plantagenet, Duke of York in the BBC Television Shakespeare 1982 productions of Shakespeare's Henry VI plays. In 1985, he played the lead role in a TV dramatisation of John Lennon's life, A Journey in the Life. In addition to TV roles, Hill appeared on stage in The Cherry Orchard, and the title roles in Macbeth and A View from the Bridge. Hill then received critical acclaim for his performance as Joe Bradshaw in Shirley Valentine (1989), about a Liverpool housewife (Pauline Collins) who was a former anti-establishment rebel and engages in an extramarital affair. Hill added more prominent films to his resume, including Mountains of the Moon (1990), Skallagrigg (1994) and Madagascar Skin (1995). In the mid-1990s, Hill began appearing in films more regularly. His first major role came in The Ghost and the Darkness (1996), starring Val Kilmer as a bridge-building engineer who must trust a big game hunter (Michael Douglas) despite their mutual animosity; Hill portrayed the role of Dr. Hawthorne. Hill then went down with the ship when he played Captain Edward J. Smith on the ill-fated Titanic (1997), by James Cameron, with whom Hill got along quite well — an experience not shared by most working on the film. Being in the then biggest grossing film of all time attracted attention to his career, as Hill became more sought-after for more prominent parts. Hill played Philos in The Scorpion King (2002), starring Dwayne "The Rock" Johnson, Michael Clarke Duncan and Kelly Hu. Hill became known to a worldwide audience when he was cast in the role of King Théoden of Rohan in Peter Jackson's The Lord of the Rings film trilogy based on Tolkien's novel of the same name. Before casting him as King Théoden, director Peter Jackson considered Hill for the part of Gandalf. When he was due to leave the set at the end of production, Jackson gave Hill two gifts, Théoden's helmet and sword Herugrim. At the 2006 BAFTA TV Awards and International Emmy Award, Hill was nominated for his portrayal of David Blunkett in the one-off satirical drama, A Very Social Secretary. Hill is one of the few actors who have acted in three films that went on to win the Academy Award for Best Picture. He did this with Gandhi (1982), Titanic (1997) and The Lord of the Rings: The Return of the King (2003). He held a minor role in the 2008 film Valkyrie, as the commanding general of the German Afrika Korp X Panzer Division, and as a voice actor for Sir Walter Beck in Fable III (2010). Due to his affinity and links to the region, along with his extensive CV in film, Hill was announced as a new patron and judge of the Norwich Film Festival, that was held on March 2012. He plays Samuel Cotton, who runs a sweet factory with his son in the 2014 three-part BBC drama series about Manchester From There To Here. Hill appears as the Duke of Norfolk in the 2015 six-part BBC adaptation of Hilary Mantel's novels, Wolf Hall. Hill currently lives in Suffolk. He is married to Marianne Hill, and has a son named Gabriel. One of two films in which Hill stars that have won 11 Oscars. 2012 Falcón Ramón Salgado 2 Sky Episode "The Blind Man of Seville"
↑ "The OxStu talks Titanic, Daniel Day-Lewis and more with film star Bernard Hill". The Oxford Student. 1 2 3 4 "Manchester Films – Bernard Hill – a biography". BBC. Retrieved 2011-08-21. ↑ "Out of work – and this time it won't just be Yosser who will feel the pain | News". Thisislondon.co.uk. 2008-12-17. Retrieved 2011-08-21. ↑ "Behind The Voice Actors - Bernard Hill". Behind The Voice Actors. ↑ "Archived copy". Archived from the original on 14 February 2012. Retrieved 2011-11-13. ↑ "Stellar cast assemble for Peter Bowker's new BBC One drama, From There To Here". BBC Media Centre. BBC. Retrieved 14 September 2013. ↑ "Norfolk". BBC. Retrieved 16 February 2015. ↑ "Bernard Hill Biography (1944–)". Filmreference.com. Retrieved 2011-08-21. ↑ "Bernard Hill Filmography, Bernard Hill, movies, Pics, Photos, Filmography". Netglimse.com. Retrieved 2011-08-21. 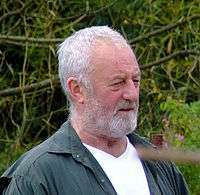 Wikimedia Commons has media related to Bernard Hill.